The Olive (Olea europaea) is a species of a small tree in the family Oleaceae, native to the coastal areas of the eastern Mediterranean Basin (the adjoining coastal areas of southeastern Europe, western Asia and northern Africa) as well as northern Iran at the south end of the Caspian Sea . Its fruit, the olive, is of major agricultural importance in the Mediterranean region as the source of olive oil. The tree and its fruit give its name to the plant family, which also includes species such as lilacs, jasmine, forsythia and the true ash trees (Fraxinus). The word 'oil' in many languages ultimately derives from the name of the tree and its fruit, including the English word oil. The olive tree is an evergreen tree or shrub native to the Mediterranean , Asia and parts of Africa. It is short and squat, and rarely exceeds 8–15 meters in height. The silvery green leaves are oblong in shape, measuring 4–10 cm long and 1–3 cm wide. The trunk is typically gnarled and twisted. The olive is one of the plants most cited in recorded literature. In Homer's Odyssey, Odysseus crawls beneath two shoots of olive that grow from a single stock, and in the Iliad,(XVII.53ff) is a metaphoric description of a lone olive tree in the mountains, by a spring; the Greeks observed that the olive rarely thrives at a distance from the sea, which in Greece invariably means up mountain slopes. Greek myth attributed to the primordial culture-hero Aristaeus the understanding of olive husbandry, along with cheese-making and bee-keeping. Olive was one of the woods used to fashion the most primitive Greek cult figures, called xoana, referring to their wooden material; they were reverently preserved for centuries. It was purely a matter of local pride that the Athenians claimed that the olive grew first in Athens. In an archaic Athenian foundation myth, Athena won the patronship of Attica from Poseidon with the gift of the olive. Though, according to the 4th-century BC father of botany, Theophrastus, olive trees ordinarily attained an age of about 200 years, he mentions that the very olive tree of Athena still grew on the Acropolis; it was still to be seen there in the second century AD; and when Pausanias was shown it, ca 170 AD, he reported "Legend also says that when the Persians fired Athens the olive was burnt down, but on the very day it was burnt it grew again to the height of two cubits;" indeed, the olive suckers readily from the stump, and the great age of some existing olive trees shows that it was perfectly possible that the olive tree of the Acropolis dated to the Bronze Age. The olive was sacred to Athena and appeared on the Athenian coinage. The Roman poet Horace mentions it in reference to his own diet, which he describes as very simple: "As for me, olives, endives, and smooth mallow provide sustenance." Lord Monboddo comments on the olive in 1779 as one of the foods preferred by the ancients and as one of the most perfect foods..
Olive oil has long been considered sacred; it was used to anoint kings and athletes in ancient Greece. It was burnt in the sacred lamps of temples as well as being the "eternal flame" of the original Olympic Games. Victors in these games were crowned with its leaves. Today, it is still used in many religious ceremonies. Over the years, the olive has been the symbol of peace, wisdom, glory, fertility, power and pureness. The olive tree and olives are mentioned over 30 times in the Bible, in both the New and Old Testaments. It is one of the first plants mentioned in the Bible, and one of the most significant. For example, it was an olive branch that a dove brought back to Noah to demonstrate that the flood was over. The Mount of Olives east of Jerusalem is mentioned several times. The Allegory of the Olive Tree in chapter 5 of the Book of Jacob in the Book of Mormon, refers to the scattering and gathering of Israel. It compares the Israelites and gentiles to tame and wild olive trees. The olive tree itself, as well as olive oil and olives, play an important role in the Bible. The olive is praised in the Quran as a precious fruit. The olive tree and olive oil are also mentioned seven times in the Quran. In Chapter 24 Al-Nur: "Allah is the Light of the heavens and the earth. The metaphor of His Light is that of a niche in which is a lamp, the lamp inside a glass, the glass like a brilliant star, lit from a blessed tree, an olive, neither of the east nor of the west, its oil all but giving off light even if no fire touches it. Light upon Light. Allah guides to His Light whoever He wills and Allah makes metaphors for mankind and Allah has knowledge of all things." (Quran, 24:35). Olive tree and olive oil health benefits have been propounded in Prophetic medicine. The Prophet Mohamed is reported to have said: "Take oil of olive and massage with it - it is a blessed tree" (Sunan al-Darimi, 69:103). The olive tree seems to have been native in the Mediterranean region and Western Asia and spread to nearby countries from there. It is estimated the cultivation of olive trees began more than 7000 years ago. As far back as 3000 BC, olives were grown commercially in Crete ; they may have been the source of the wealth of the Minoan Civilization. The ancient Greeks used to smear olive oil on their bodies and hair as a matter of grooming and good health. Olive trees are very hardy, drought-, disease- and fire-resistant, and can live for very long. Its root system is very robust and capable of regenerating the tree even if the above-ground structure is destroyed. The older an olive tree is, the broader and gnarlier its trunk appears. Many olive trees in the groves around the Mediterranean are said to be several centuries old, and in some cases this has been verified scientifically. Pliny the Elder told of a sacred Greek olive tree that was 1600 years old. Several trees in the Garden of Gethsemane (from the Hebrew words "gat shemanim" or olive press) in Jerusalem are claimed to date back to the time of Jesus. Some Italian olive trees are believed to date back to Roman times, although identifying progenitor trees in ancient sources is difficult. One olive tree in Bar, Montenegro , is claimed to be over 2000 years old . The age of an olive tree in Crete , claimed to be over 2,000 years old, has been determined on the basis of tree ring analysis. Another well-known olive tree on the island of Brijuni (Brioni), Istria in Croatia , has been calculated to be about 1,600 years old. It still gives fruit (about 30 kg per year), which is made into top quality olive oil. An olive tree in west Athens, named "Plato's Olive Tree", was rumored to be a remnant of the grove within which Plato's Academy was situated, which would date it to approximately 2,400 years ago. The tree was a cavernous trunk from which a few branches were still sprouting in 1975, when a traffic accident caused a bus to fall on and uproot it. Since then the trunk is preserved and displayed in the nearby Agricultural University of Athens . A supposedly even older tree, called the "Peisistratos Tree", is located by the banks of the Cephisus River, in the municipality of Agioi Anargyroi , and is said to be a remnant of an olive grove planted by Athenian tyrant Peisistratos in the 6th century BC. According to a recent scientific survey, there are tens of ancient olive trees throughout Biblical Israel, 1600-2000 years old, from even before the rise of Islam. Specifically, two giant olive trees in the Arab town of Arraba and five trees in Deir Hanna , both in Galilee region, have been determined to be over 3000 years old. All seven trees continue to produce olives. A tree located in Santu Baltolu di Carana in Sardinia, Italy , named with respect as the Ozzastru by the inhabitants of the region, is claimed to be 3000 to 4000 years old according to different studies. In the same natural garden, a few other millenary trees can be admired. 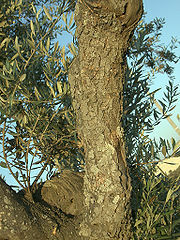 The olive tree has been cultivated for olive oil, fine wood, olive leaf, and the olive fruit. The earliest evidence for the domestication of olives comes from the Chalcolithic Period archaeological site of Teleilat Ghassul in what is today modern Jordan . Farmers in ancient times believed olive trees would not grow well if planted more than a short distance from the sea; Theophrastus gives 300 stadia (55.6 km) as the limit. Modern experience does not always confirm this, and, though showing a preference for the coast, it has long been grown further inland in some areas with suitable climates, particularly in the southwestern Mediterranean (Iberia , northwest Africa) where winters are mild. Olives are now cultivated in many regions of the world with Mediterranean climates, such as South Africa, Chile , Australia, the Mediterranean Basin, Israel , Palestinian Territories and California and in areas with temperate climates such as New Zealand , under irrigation in the Cuyo region in Argentina which has a desert climate. They are also grown in the Córdoba Province, Argentina , which has a temperate climate with rainy summers and dry winters (Cwa). The climate in Argentina changes the external characteristics of the plant but the fruit keeps its original characteristics. 'Amfissa', excellent quality Greek table olive grown in Amfissa , Central Greece near the oracle of Delphi . Amfissa olives enjoy PDO (Protected designation of origin) status and are equally good for olive oil extraction. The olive grove of Amfissa, which consists of 1,200,000 olive trees is a part of a protected natural landscape. 'Gemlik', variety from the Gemlik area of northern Turkey . They are small to medium sized black olives with a high oil content. This type of olive is very common in Turkey and is sold as a breakfast olive in the cured formats of either Yagli Sele, Salamura or Duble; though there are other less common curings. The sign of a traditionally cured Gemlik olive is that the flesh comes away from the pip easily. 'Manzanilla', a large, rounded-oval fruit, with purple-green skin, originating in Dos Hermanas , Seville , in southern Spain . Rich taste and thick pulp. A prolific bearer, grown around the world. 'Arbequina', a small, brown olive grown in Catalonia , Spain, good for eating and for oil. 'Hojiblanca', originating in the province of Córdoba , Spain, its oil is widely appreciated for its slightly bitter flavour. 'Kalamata', a large, black olive with a smooth and meatlike taste, named after the city of Kalamata , Greece , used as a table olive. These olives are usually preserved in vinegar or olive oil. Kalamata olives enjoy PDO (Protected designation of origin) status. 'Koroneiki', originating from the southern Peloponese , around Kalamata and Mani in Greece. This small olive, though difficult to cultivate, has a high yield of olive oil of exceptional quality. 'Picholine' or 'pecholine', originating in the south of France . It is green, medium size, and elongated. The flavour is mild and nutty. 'Picual', originating in southern Spain (province of Jaén ), it is the most widely cultivated olive in Spain, comprising about 50% of Spain's olive production and around 20% of world olive production. It has a strong but sweet flavour, and is widely used in Spain as a table olive. Moreover, its oil has some of the best chemical properties found in olive oil, being the richest in oleic acid and vitamin E.
'Lucques', originating in the south of France (Aude département). They are green, large, and elongated. The stone has an arcuated shape . Their flavour is mild and nutty. 'Souri', originating in Lebanon (the town of Sur (Tyre)) and widespread in the Levant. It has a high oil yield and exceptionally aromatic flavour. 'Mission' originated on the California Missions and is now grown throughout the state. They are black and generally used for table consumption. They are celebrated at Olive Festivals throughout the state of California. Olive trees show a marked preference for calcareous soils, flourishing best on limestone slopes and crags, and coastal climate conditions. They grow in any light soil, even on clay if well drained, but in rich soils they are predisposed to disease and produce poorer oil than in poorer soil. (This was noted by Pliny the Elder.) Olives like hot weather, and temperatures below 14 °F (-10 °C) may injure even a mature tree. They tolerate drought well, thanks to their sturdy and extensive root system. Olive trees can live exceptionally long, up to several centuries, and can remain productive for as long, if they are pruned correctly and regularly. Olives grow very slowly, and over many years the trunk can attain a considerable diameter. A. P. de Candolle recorded one exceeding 10 m in girth. The trees rarely exceed 15 m in height, and are generally confined to much more limited dimensions by frequent pruning. The yellow or light greenish-brown wood is often finely veined with a darker tint; being very hard and close-grained, it is valued by woodworkers. There are only a handlful of Olive varieties that can be used to cross-pollinate. 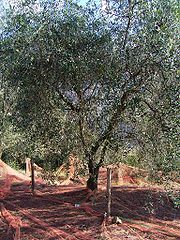 Pendolino olive trees are partially self-fertile, but you need pollenizers if you want a large fruit crop. Other compatible olive tree pollenizers include Leccino and Maurino. Pendolino olive trees are used extensively as pollenizers in large olive tree groves. Olives are propagated in various ways. The preferred ways are cuttings or layers; the tree roots easily in favourable soil and throws up suckers from the stump when cut down. However, yields from trees grown from suckers or seeds are poor; it must be budded or grafted onto other specimens to do well (Lewington and Parker, 114). Branches of various thickness cut into lengths of about 1 m and planted deeply in manured ground, soon vegetate. Shorter pieces are sometimes laid horizontally in shallow trenches and, when covered with a few centimetres of soil, rapidly throw up sucker-like shoots. In Greece, grafting the cultivated tree on the wild tree is a common practice. In Italy, embryonic buds, which form small swellings on the stems, are carefully excised and planted under the soil surface, where they soon form a vigorous shoot. Olives are harvested in the fall. More specifically, green olives are picked at the end of September to about the middle of November. Blond olives are picked from the middle of October to the end of November and Black olives are collected from the middle of November to the end of January or early February. In southern Europe, harvesting is done for several weeks in winter, but the time varies in each country, and with the season and the cultivar. Most olives today are harvested by shaking the boughs or the whole tree. Using olives found lying on the ground can result in poor quality oil. Another method involves standing on a ladder and "milking" the olives into a sack tied around the harvester's waist. A third method uses a device called an oli-net that wraps around the tree trunk and opens to form an umbrella-like catcher from which workers collect the fruit. Another method uses an electric tool, the oliviera, that has large tongs that spin around quickly, removing fruit from the tree. This method is used for olives used for oil. Table olive varieties are more difficult to harvest, as workers must take care not to damage the fruit; baskets that hang around the worker's neck are used. In some places in Italy and Greece, olives are harvested by hand because the terrain is too mountainous for machines. As a result, the fruit is not bruised, which leads to a superior finished product. The method also involves sawing off branches, which is healthy for future production. The amount of oil contained in the fruit differs greatly by cultivar; the pericarp is usually 60–70% oil. Typical yields are 1.5-2.2 kg of oil per tree per year. One basic fermentation method involves a 10% solution of salt and vinegar in water. The ratio is 10 kg olives to 7 liters of water, 800 g salt and 300 ml of vinegar. Fresh are often sold at markets. Olives can be used green, ripe green (a yellower shade of green, or green with hints of colour), through to full purple black ripeness. Olives should be selected for general good condition and for firmness if green. The olives are soaked in water to wash, then drained. 7 litres (7 kg) of room temperature water is added to a container, plus 800 g of sea salt and one cup (300 g) of white wine or cider vinegar. Each olive is slit deeply with a small knife; large fruit (e.g., 60 fruit per kg) should be slit in multiple places. After some weeks, the salinity drops from 10% to around 5 to 6% once the water in the olives moves into solution and the salt moves into the olives. The olives are weighed down with an inert object such as a plate so they are fully immersed and lightly sealed in their container. The gases of fermentation should be able to escape. It is possible to use a plastic bag partially filled with water, and lay this over the top as a venting lid which also provides a good seal. The exclusion of oxygen is helpful, but not as critical as when fermenting grapes to produce wine. The olives are edible within 2 weeks to a month, but can be left to cure for up to three months. They can be tasted at any time because the bitter compounds are not poisonous, and oleuropein is a useful antioxidant in the human diet. Olives are the most extensively cultivated fruit crop in the world. Cultivation area tripled from 2.6 to 8.5 million hectares between 1960 and 2004. The ten largest producing countries, according to the Food and Agriculture Organization, are all located in the Mediterranean region and produce 95% of the world's olives. In some other parts of the world where it has been introduced, most notably South Australia , the olive has become a major woody weed that displaces native vegetation. In South Australia its seeds are spread by the introduced red fox and by many bird species including the European starling and the native emu into woodlands where they germinate and eventually form a dense canopy that prevents regeneration of native trees. As the climate of South Australia is very dry and bushfire prone, the oil rich feral Olive tree substantially increases the fire hazard of native Sclerophyll woodlands. "He learned from the Nymphai how to curdle milk, to make bee-hives, and to cultivate olive-trees, and was the first to instruct men in these matters." (Diodorus Siculus, 4. 81. 1). Towards the end of the second century AD the traveler Pausanias saw many such archaic cult figures. "Indeed it is said that at that [ancient] time there were no olives anywhere save at Athens." (Herodotus, 5. 82. 1 ). Theophrastus, On the Causes of Plants,, 4.13.5., noted by Signe Isager and Jens Erik Skydsgaard, Ancient Greek Agriculture, An introduction, 1992, p. 38. "...which is still shown in the Pandroseion" (pseudo-Apollodorus, Bibliotheke, 3.14.1). Pausanias, Description of Greece 1. 27. 1. Isager and Skydsgaard 1992, p. 35. Janse, J. D. 1982. Pseudomonas syringae subsp. savastanoi (ex Smith) subsp. nov., nom. rev., the bacterium causing excrescences on Oleaceae and Nerium oleander L. Int. J. Syst. Bacteriol. 32:166–169. Burr, M. 1999. Australian Olives. A guide for growers and producers of virgin oils, 4th edition. Dirk HR Spennemann & Allen, L.R. (2000) Feral olives (Olea europaea) as future woody weeds in Australia: a review. Australian Journal of Experimental Agriculture 40: 889–901.